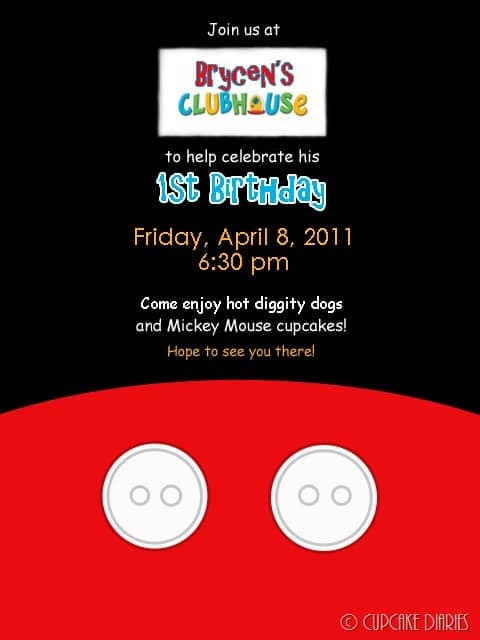 I made this invitation in Photoshop. The pants and buttons are drawn on. We had the party at “Brycen’s Clubhouse” (Brycen’s house) and invited our immediate family. We fed all the party guests “hot diggity dogs” (hotdogs) and had a few people bring a few different salads. For dessert we enjoyed homemade Mickey Mouse cupcakes. It worked really well! 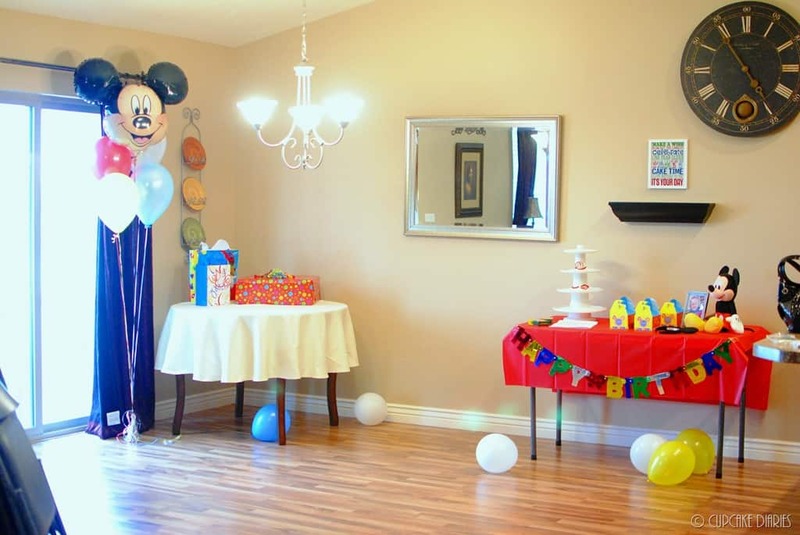 A quick and easy way to get more of your theme in the room without going crazy is balloons. I bought one large Mickey balloon and some colors in the show to make that bouquet seen above. I did more balloons on the other side of the room. Balloons on the floor are another good way to decorate, especially when little kids are invited to the party. They’re a big hit! Bright table cloths add color and a lot of good contrast for an easy and fun look to your décor. We already had a stuffed Mickey Mouse so he was an easy decoration! I put a picture of the birthday boy on this table. His bright smiling face lit up this table even more. 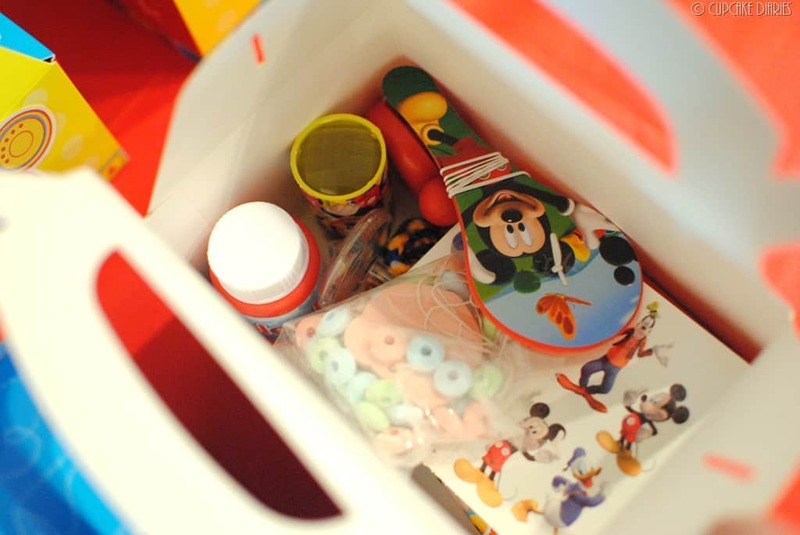 Those little boxes are the “Mouseke-Tool” boxes for the kids coming to the party. 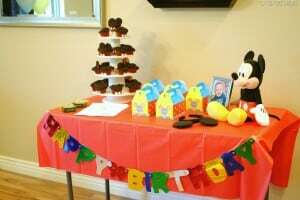 The dessert tower is holding two dozen homemade Mickey Mouse cupcakes. 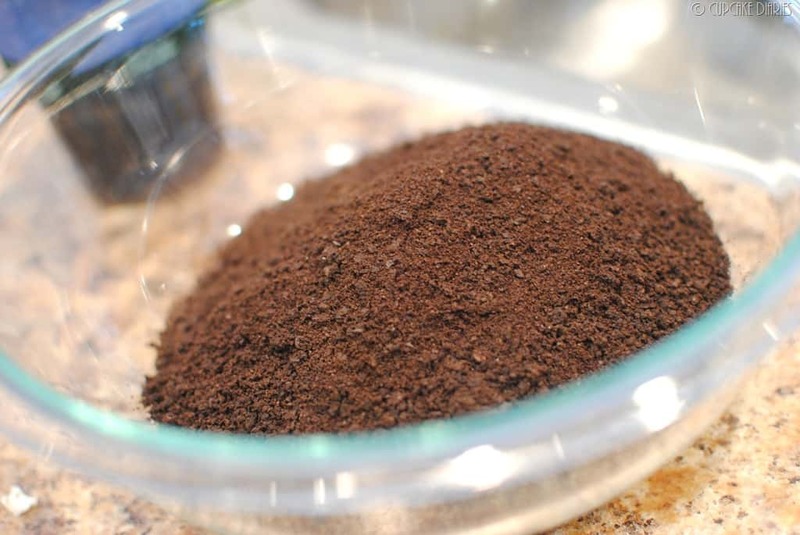 It’s amazing what a little crushed up Oreo and a couple of vanilla wafers can do! 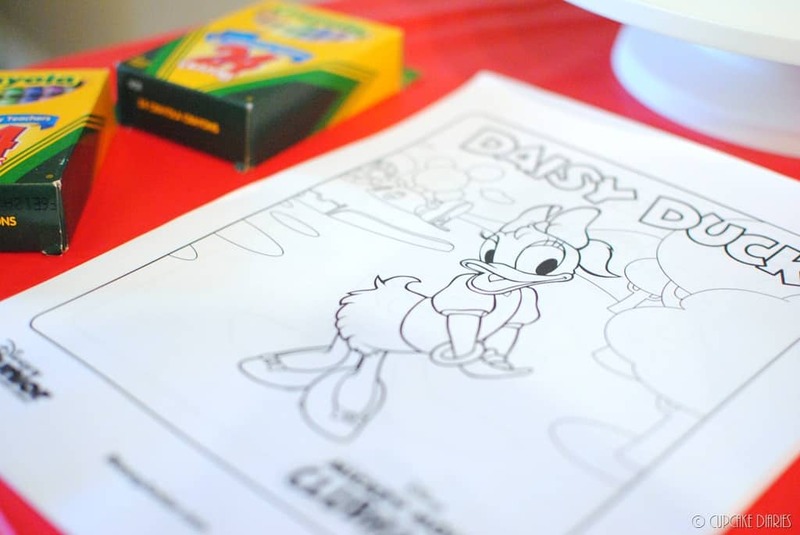 Below the dessert stand sits a pile of “Mickey Mouse Clubhouse” coloring pages and Crayola crayons. And can’t forget a “Happy Birthday” sign and Mickey Mouse ears for the birthday boy! Sam’s Club (and probably Costco) sells the yummiest hotdogs in the cafeteria area. They’re Nathan’s hotdogs, the really long and delicious hotdogs that are sold at baseball games. And did you know you can buy boxes of them from Sam’s Club? So that’s exactly what my mom did. She contributed hotdogs to our party and they were a big hit. The little kids ate Oscar Mayer franks. 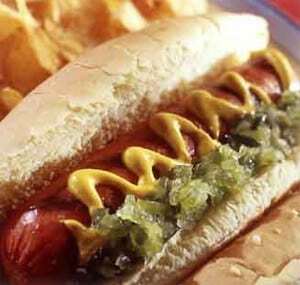 You can find the long buns to fit Nathan’s hotdogs at your grocery store. We bought the long Hostess restaurant style buns. Bake the cupcakes the night before you need them to ensure they are cool. There’s nothing sadder when baking than frosting a cake or cupcake when it’s not cool. You end up with a melted mess. Remember to fill them 2/3 full and no more or they will look like funny mushrooms. Time to get decorating! I did a horrible job with taking pictures of the process. If truth were told, I got to into making them and forgot to take pictures. BUT I do have a picture of the crushed Oreos! My mom and twin sister helped me put the cupcakes together and we started with the Oreos. We first scraped all the cream off the cookies to make sure the crumbs were completely dark. We put the cookies in my little chopper and pulsed them to crumbs. **We crushed up an entire package of cookies and didn’t use all of it. I’ll be using that for a dessert in the near future. If you don’t want to have leftover cookie crumbs, I would start with half the package or go row by row so you don’t end up with a ton leftover. 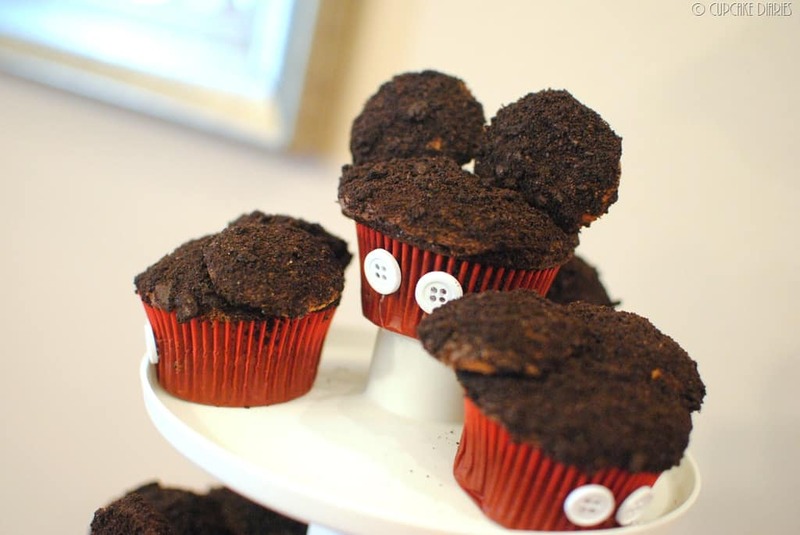 We began by frosting a cupcake and dipping it in the cookie crumbs. We moved the cupcake around in the bowl till all the frosting was covered on the top. 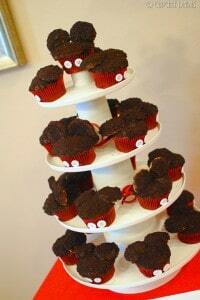 Next we took two vanilla wafers for the ears on the cupcake and frosted one side of them with chocolate frosting. Then we dipped the frosting side down into the cookie crumbs to coat the ears. For a cupcake with tall ears: After dipping the ears in crumbs we pressed them into the cupcake a little and right next to each other. If we pushed too far down the cupcake started to break, so we put them in the fridge to help hold together. For ears lying down: After dipping the ears in crumbs we put a little frosting on the back of each ear and laid them flat on the top of the cupcake above the middle and placed them in the fridge to set. 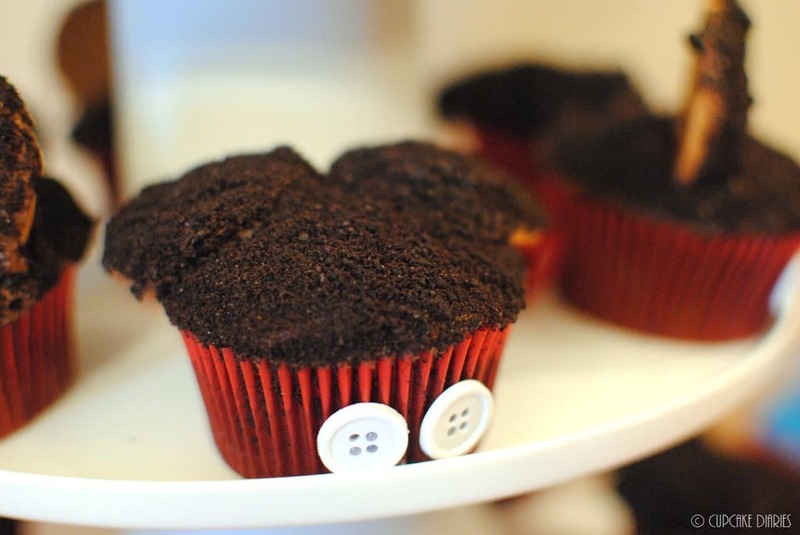 When the ears were all on I got my glue gun out and glued on white buttons to the front of the cupcakes to make them look like Mickey’s pants. I found this subway art over at eighteen25. All their subway art is free to download. The files are for 16×20 prints, but I printed mine at 8×10. As you can see it printed up just fine! It adds a great touch to any party. They have a boy print and a girl print. 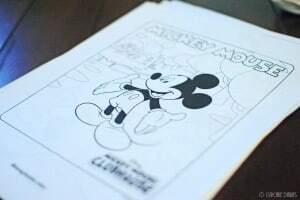 I found these coloring pages over at Disney Junior. 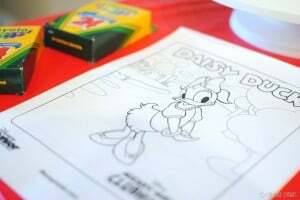 The kids loved coloring after eating their hot diggity dogs! I really wanted to put something together for the kids to take home some mouseke-tools. A couple months before Brycen’s birthday I received a magazine in the mail from Birthday Express with a whole bunch of ideas for a first birthday theme. 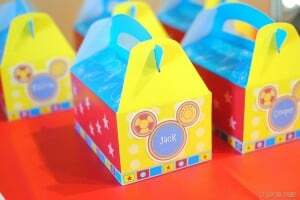 I hopped on their website, looked up the Mickey Mouse Clubhouse section, and found a whole bunch of fun things that we could use for his party. I ended up buying two packages of four party favor boxes (shown above). I bought the empty ones so I could fill them with what I wanted, but they also sold them with favors included. Click here to check out the boxes with included favors. As far as the child’s name on the side with the Toodles (he’s a character on the show and the mouse-shaped thing on the side of the box), I uploaded a picture of Toodles in Photoshop and just added the kids’ names. I made five separate .jpg files. The boxes were a big hit and really fun to put together! 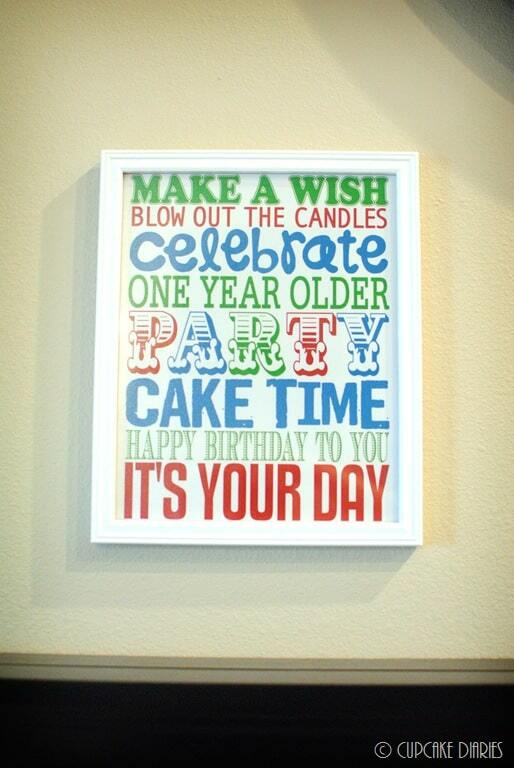 Like I said before, you can find all of these fun things and more at Zurchers website or at Birthday Express! 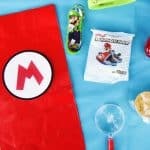 Even Walmart has a few fun things to help with the party. I bought this stuffed Mickey Mouse at Walgreens for a Valentine’s gift for Brycen. It was a pretty random find, thanks to a tip from a friend! (You know who you are, friend!) He seemed to work perfectly to just set out as part of the décor. 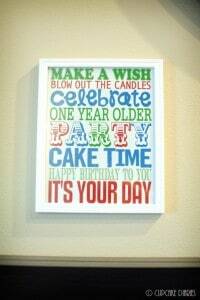 If you have stuffed animals and toys already at home that work with the party theme, they work great for decorating! 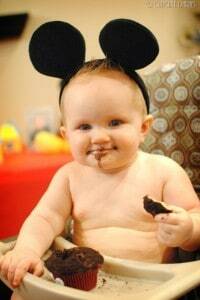 And it’s not a Mickey Mouse party without some ears! I found these at Birthday Express as well. They fit perfectly for his first birthday, but I don’t recommend getting this specific pair for anybody older than probably two or they’ll most likely be too small. 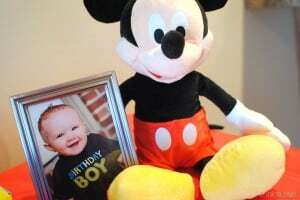 They did, however, have an option of Mickey ears for an older child. Looks like such a fun party!! Brycen is adorable! The food and decorations look fabulous! Way to go Alli! What a cute, cute party for Brycen. I just might have to steal it and do Micky and Minnie Mouse for Kate. She loves thems so much. What a cute little birthday boy! What a cute birthday party! You’re such a good mom Alli! Happy birthday Brycen! 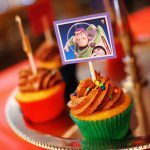 That was the best birthday party ever!! Loved all the decor…it couldn’t have been more perfect!